Hello all! OMG my newest nail polish is absolutely gorgeous and it's from Born Pretty Store. This is from their Sweet Color Candy Nail Polish range and is number S048. 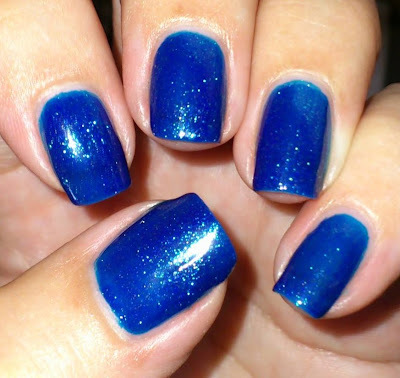 A stunning royal blue with a lighter blue shimmer running through it. A beautiful polish, easy to apply, great formulation and nice brush which makes it so easy to apply. The contrasting shimmer is the icing on the cake, it's a real winner! A super sparkly shimmer nail polish in a fantastic royal blue shade, very apt for the arrival of the new born Prince George! The Sweet Color range is available in lots of different colours, shimmers, cremes & glitters - all wonderful! 12ml bottle. Highly recommended! The Sweet Color Candy Nail Polish #S048 is currently $6.14 / £3.96 / €4.60 and if you use my discount code HXBQ10 you get 10% off!! Check out the Born Pretty Store website for loads of cool nail art goodies.